This was my second snippet technique quilt and the design was based on an old calendar photograph taken of Bass Harbor, Maine by Bob Hylander. My stepmom found this old photo in the attic at Dad’s and gave it to me saying it was one of Dad’s favorite views of the harbor. I created this quilt for my Dad as a Father’s Day gift in 2004. It even has my Dad’s boat, the Cindy Lou, moored in the harbor. 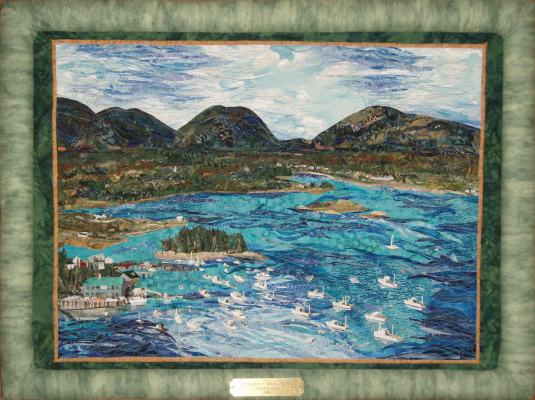 A close-up view of some of the boats would show that up to 10 different fabrics were used to create them even though the boats are less than an inch long in the quilt.The ability to use such minuscule pieces of material is what gives this style of quilts the detail and depth that one captures usually with an artist medium such as paint or pencil. The challenge is in the quilting as these pieces are too stiff to hand quilt by the time all the layers have been applied. My personal preference is to hand quilt my pieces but these quilts force me to do an occasional design by machine.I prefer to employ metallic threads to add more reflective light to the quilts but this does challenge the sewing machine as the thread tends to break more often, even with a specialized needle in place. I just incorporate that issue into the design work itself. The final piece measures 32″ wide by 24″ height and I framed it with a padded, fabric-covered wood frame. It still hangs in a place of honor in my Dad’s living room.